Many people visit Cairns simply to access the Great Barrier Reef and spend little time exploring other nearby localities. The reef is incredible, and is a definite must-see for all visitors to Australia. However, there are also many other attractions in and around Cairns that should also not be missed in this very special part of the world. Let’s start with the reef. With over 900 islands spread over more than 340,000 square kilometres, the Great Barrier Reef is the world’s largest coral reef system. The best way to spend time exploring the reef is to spend a few days at sea, on a liveaboard if you’re a scuba diver wanting to reach the most pristine dive sites. However it is also possible to make daytrips to the reef and from Cairns these mostly go to Green Island, Michelmas Cay and the Frankland Islands. With the Great Barrier Reef on the doorstep, scuba diving is big business in Cairns. What better place to learn to dive? Be warned though, if you are lucky enough to learn to dive on a tropical reef then future diving opportunities may not live up to expectations! Spectacular Mossman Gorge is in Daintree National Park, around 80km north of Cairns. The Mossman River flows through the pristine rainforest and mountains in the area. This is the natural environment of the local Kuku Yalanji people who offer guided dreamtime walks in the park. The cold streams that run over the smooth granite boulders and through the humid rainforest also provide a wonderful spot to relax and cool off. Considered by many to be a hippy getaway, Kuranda offers a cool retreat high above Cairns, that is full of life. The settlement extends along a main road and much of the activity happens around the Kuranda markets. There are also galleries showcasing Aboriginal art, shops selling locally made produce, cafes and a pub. The journey to and from Kuranda is part of the reason a visit is so much fun. The Skyrail offers spectacular views over the rainforest, Coral Sea, and on a clear day Cairns, while the Scenic Kuranda Railway also offers great views and introduces travellers to the history behind the construction of the railway en route. A collection of small villages and settlements together form the Atherton Tablelands. This largely agricultural area offers much for foodies who will enjoy the vineyards, dairies and fresh locally grown produce, which is often for sale by the roadside with purchasers expected to leave payment in an honesty box. There are also several great sights including the ancient and enormous Atherton Fig Tree, the opportunity to mine your own gemstones and several beautiful lakes. Life moves a bit slower up on the tablelands than down by the coast, providing a relaxing getaway. Fringed by beautiful Four Mile Beach, Port Douglas is a small town of shops, tourism enterprises and restaurants that comes alive on Sundays, which is market day. 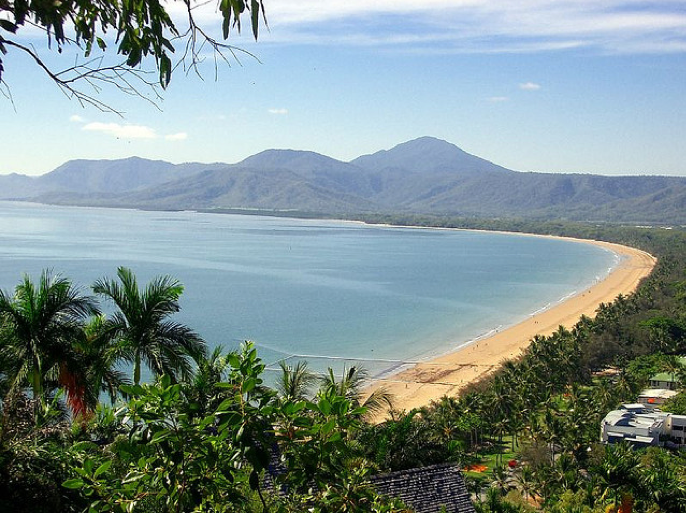 The road leading into Port Douglas is lined with high-end resorts that face onto Four Mile Beach on one side, and backpackers’ hostels and shops on the other side of the road. The town has a thriving marina that provides a busy gateway to the Great Barrier Reef. Housed in an old Queenslander building, Cairns Historical Society Museum is home to a huge collection of historical artefacts and photographs. The museum covers Cairns’ Aboriginal history, the effect of World War Two on Cairns and also provides information on farming, aviation and medicine in Cairns through the years. The exhibits provide an extensive introduction into local culture and history. Offering an opportunity to immerse yourself in the world’s oldest living culture, the Aboriginal experience offered at the Tjapukai Aboriginal Park is a fascinating way to spend a few hours. The park offers two tours, one by day and one by night. On the day tour visitors are taught to play the didgeridoo, throw spears and boomerangs and are also introduced to the medicinal properties of bush tucker. Aboriginal dances are performed and the dreamtime stories are told. On the night tour visitors join a traditional Tjapukai corroboree and experience a didgeridoo blessing ceremony and a fire-making show before enjoying a buffet dinner and cultural performance show. Cairns has a magnificent Esplanade boardwalk stretching north from the marina. The Cairns Esplanade Lagoon is a huge open air swimming pool that faces the ocean and becomes shallower as you move away from the sea, eventually becoming paddling depth. One side is set out as a beach, complete with sand, while the other is finished in decking. The area is surrounded by grass and gardens that also offer picnic shelters and public barbecues. As you walk north along the foreshore there is a water park for small children and exercise equipment is also available. Cairns locals either live inland from the centre or along the north beaches at Trinity Beach and Palm Cove. The local tides leave Cairns Bay looking little more than an expanse of mudflats a lot of the time, but the beaches slightly north of town are still swimmable (jellyfish and crocodiles aside; keep an eye out for signs). Modelled on the night markets of South East Asia, Cairns Night Markets was originally only set up as a temporary venture but became popular enough that it is now a permanent feature of town. Mostly selling souvenirs, the 130 stalls operating offer everything from jewellery and clothing to knick-knacks and gifts. Traders also offer massages and there is a large food court. Get your marsupial fix at Cairns Tropical Zoo, which boasts a fantastic array of native Australian wildlife, all in one locations, very conveniently for overseas visitors keen to see the local wildlife. The zoo is home to several native species including koalas, kangaroos, wallabies, wombats, dingoes, echidnas, crocodiles, reptiles and birds. Animal feeding shows and animal photo sessions take place during the day. Cairns attracts many backpackers seeking work fruit picking nearby and has also evolved into a bit of an adventure centre for those seeking an adrenaline rush. Amongst other things, sky diving over the reef, trail bike adventures, ziplining through the rainforest and bush safaris are all offered by local operators. Have you been to Cairns? What would you include on a visitor’s itinerary?